How I Met Your Mother: "The Fight"
Finally, an answer to the question I've been asking all my life: Why do men fight? Seriously, I want to know. Despite growing up with two brothers, I remain blissfully ignorant of testosterone and all its ways. Why must one do foolish things simply because one is called "chicken," or because the words "I dare you" are uttered? What is it about slights of tongue or pen that progress immediately to violence, neither passing Go nor collecting $200? I'm genuinely sad to report that tonight's sitcom episode did not clear up this mystery. But it was two-thirds of a really snappy half-hour of comedy. The gang is sitting at a corner booth because their usual table is occupied, a fact that enrages their toupee-clad bartender Doug, who has appointed himself their personal protector. So Doug takes the three squatters out in the alley and lays 'em all on the pavement. But Ted (in an effort to claim his manhood) and Barney (in an effort to turn on Robin, who confesses to a weakness for brawlers) claim credit for some of the mayhem even though they arrived late to the party. The assaulted parties sue, Ted and Barney confess that the only punches they landed were the ones that self-inflicted their wounds, and Ted gets all that fightin' out of his system. "The Fight" had third-act problems for me — it seemed as though the writers had only one idea that could pay off in the final scenes, and that one was a throwaway (Marshall turning to be an accomplished pugilist). But up until then, the comedy was fleet and surprisingly insideriffic. 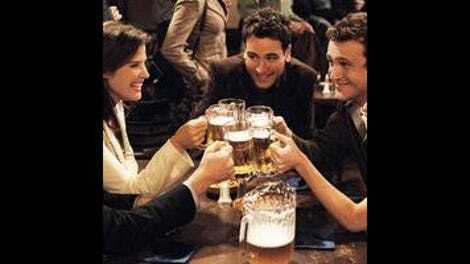 As longtime fans, didn't we enjoy the callbacks to episodes past, nestled cunningly in the rapid-fire flashbacks that are key to HIMYM's style? Doug turns out to be standing in the background of scenes from the past couple of seasons (including my favorite, the pencil up Barney's nose in "Miracles"), a little nod to the sitcom convention where the characters suddenly have an intimate acquaintance or relative that we've never seen before. And the bong-sized sandwich that undergraduate Marshall is enjoying while he and Ted watch the kung fu movies is truly a masterstroke, a reference to "How I Met Everyone Else," in which Ted substitutes the word sandwich for pot for his future children's delicate ears. You know I'm an apologist for the laugh track, even though it bothers many of you who feel like the show should just give in to its single-camera leanings. 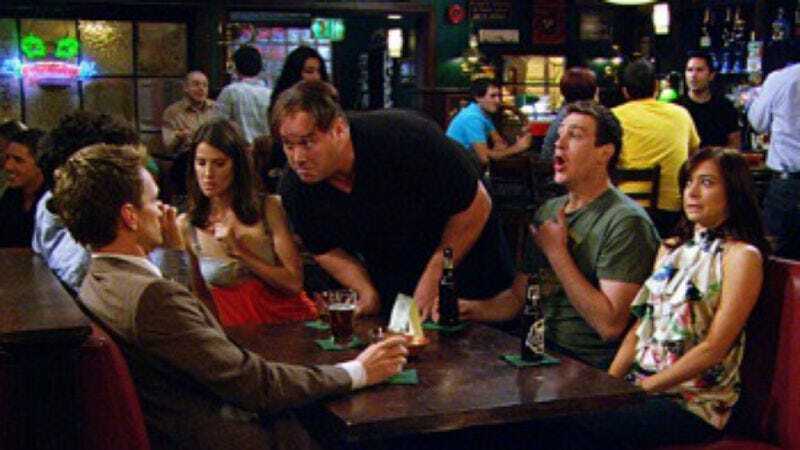 Tonight, around the time Barney threw away the line "the legendary tale of how we beat up some guys," I almost believed that the strange hybrid comedic form HIMYM attempts reached a new level of naturalness. We can enjoy the traditional beats (Lily urging Marshall to visit her class to talk about non-violence: "It might just set them straight, and save me from having to get up early to make a lesson plan"), but get an extra kick out of the bits of business that zip by too fast for audience response ("I'm on the forums everyday, and three to five years from now …"). Too bad "The Fight" couldn't give us a meaningful resolution, but given the cleverness of the comedy tonight, there's not much call for complaint. - Marshall, that is a radical haircut. The first three times he fleetingly appeared in the cold open, I actually wasn't sure it was him. Of course, it didn't help that I was wearing my old glasses and squinting hard to try to combat dry eyes. - The bit about Barney using the titles of black sitcoms from the seventies as conversational filler when he's not paying attention was okay. The payoff when Doug calls them all out to the alley to fight — "What's happening now?" — was genius. - What with the lightsaber technology flashforward and the Thing reference (Ted, on his way out to the fight: "It's clobberin' time"), HIMYM was almost as geeky as BBT tonight. - Perhaps instead of my daughter always wanting to imitate "Kung Fu Panda!" and pretend punch me, I can teach her about Mahatma Panda. And Martin Luther Koala. - "I had a salty lunch."